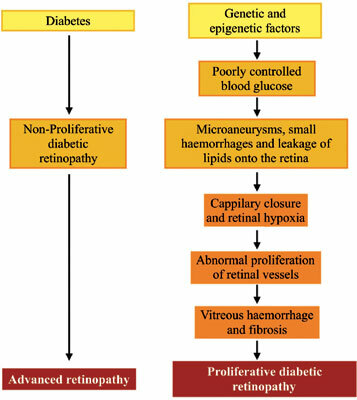 Diabetic retinopathy (DR) remains the leading cause of blindness in working-aged adults around the world. The proliferative diabetic retinopathy (PDR) and diabetic macular edema (DME) are the severe vision threatening stages of the disorder. Although, a huge body of research exists in elaborating the pathological mechanisms that lead to the development of DR, the certainty and the correlation amongst these pathways remain ambiguous. The complexity of DR lies in the multifactorial pathological perturbations that are instrumental in both the disease development and its progression. Therefore, a holistic perspective with an understanding of these pathways and their correlation may explain the pathogenesis of DR as a unifying mechanism. Hyperglycemia, oxidative stress and inflammatory pathways are the crucial components that are implicated in the pathogenesis of DR. Of these, hyperglycemia appears to be the initiating central component around which other pathological processes operate. Thus, this review discusses the role of hyperglycemia, oxidative stress and inflammation in the pathogenesis of DR, and highlights the cross-talk amongst these pathways in an attempt to understand the complex interplay of these mechanisms. Further, an effort has been made to identify the knowledge gap and the key players in each pathway that may serve as potential therapeutic drug targets. Pathophysiology, hyperglycemia, polyol pathway, hexosamine pathway, AGEs, oxidative stress, inflammation, cross-talk.